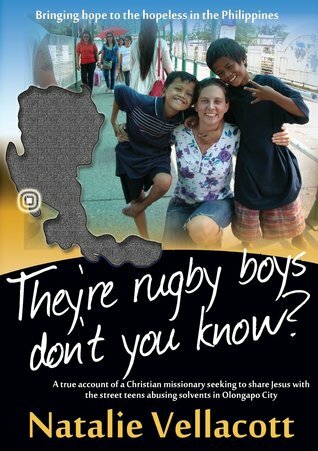 Jason McIntire’s review of They're Rugby Boys, Don't You Know? Jason McIntire's Reviews > They're Rugby Boys, Don't You Know? For those who think that mission work is always glamorous and glorious, with mounds of fruit for a few weeks' labor, Rugby Boys is a trip back to reality. You'll learn patience along with Vellacott as she and her companions struggle mightily to get just a few boys free from solvent abuse and a self-destructive life on the street. The things that drive these boys to go back to lives of drugs, over and over again, may not be the same things you'd expect. (When two of the boys were in Rehab, which is pretty much like prison.) "Interestingly, the thing that Paul and Joel were most concerned about was that their Facebook profiles might be deleted due to inactivity on their accounts. I was incredulous when they mentioned this, as that would have been the least of my priorities in a place like Rehab, but, again, it demonstrated their immaturity in setting priorities and reminded me that they were just children." "...it remains true that a person can be given all of the food and material help in the world, but if they die without Jesus, they will spend an eternity in hell. After my time on the ship, my slogan became 'Help and Hope must go Hand in Hand.'" There is some adult-themed stuff in Rugby Boys, mostly about the boys being unclothed or behaving inappropriately. Nothing sensational, but I wouldn't recommend the book for kids because of those elements. The writing style, with a typo here and there, is not particularly literary. It reads like a blog - but the kind of blog you keep coming back to, because stylistic or not, it has something to say. Sign into Goodreads to see if any of your friends have read They're Rugby Boys, Don't You Know?.